Perhaps some grace can be bestowed upon people who have a blog and then abandon it for months and months. I of course am one of those people, and even though I’ve been busy composing blog posts in my head, you can’t read them if I don’t type them out! And the honest truth is that I’ve been holding back because I’ve been feeling this pressure to make every blog entry deep and profound. This is a burden that I am I alone have placed upon myself since our Ava journey and her death. I ask myself, ‘Are people really going to want to read my trivial and somewhat meaningless entries?’ And then I tell myself “No, they wouldn’t”, and I walk away. But let’s be honest, I’m not writing for the masses, I’m writing because it’s in me to write! It’s something God has put in me to do that I love, so I have to let my go of my misgivings and just write because I can, because I have a blog and I’m allowed to… so there! So I might even attempt at posting a trivial entry sometime soon, this entry however is not. Kinda ironic really. 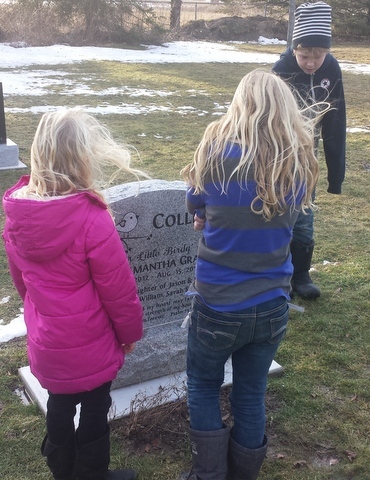 This post is about visiting Ava, which as you can see from the picture below is what our family calls our visits to Ava’s grave. We all pile in the car and on the way there I feel sad, but I also experience a slight form of anticipation like I’m going to be near my baby again. I get out of the car feeling a little keyed up, and then a few moments later I’m standing at her grave and I realize once again that I’m not feeling it. In fact I’m having a really hard time feeling connected to this granite slab with Ava’s name on it. Sure I’m standing over her… rather macabre.. standing over your rotting daughter.. but where is the sense of connection that I’m looking for? That connections not there because Ava’s not here. This is just her memorial, the stone that we have erected to let the world know that we loved her and remember her. It’s in a sense her little place in the world, but it’s here in the place of her. Well, since most of the western world today who acknowledges a God believes that every good person who dies automatically goes to heaven, most people would affirm with me that that heaven is where Ava is. But for those of us who are followers of Jesus Christ and believe the Bible as the perfect and unerring word of God, there aren’t actually any verses or even a verse in the Bible that clearly and definitely say that babies or small children automatically go to heaven. Crazy right? And to make it even more confusing the Bible makes it very clear that when we are born we get our own share of Adam’s sin often called ‘original sin’ and therefore we are all born sinners and from day one are separated from a good and perfect and just God who can tolerate no sin. So now we have a problem because the Bible also tells us that there is NOTHING we can do to save ourselves, nothing at all. Not a word or a good deed or the power of positive thought or anything that could clean us up from this sin and shield us from the wrath of God and eternal separation from Him. But then we are given hope… Jesus appeared on earth. God in the flesh and He came among us and taught us and showed us a way to be right with God again. This was through the work of the cross when Jesus died for us, and took our place and our punishment and bore our sin on the cross and paid the high price sin demanded, and then rose again! Completely victorious, conquering death and sin, AMEN! So the Bibles says if we believe in Him and accept His free gift of salvation, His blood will remove our sin and save us so that we can go and be with God in heaven for all eternity. Um… so again that leaves us with a problem. Because even though salvation is a free gift, we have to accept it. Romans 10:9-10 says that we have to confess with our mouth that Jesus is Lord and believe in our hearts that God raised him from the dead in order to accept this free gift, which works for me, but how in the world was my 8 month old baby supposed to be able to do that? How could she confess with her mouth that Jesus is Lord and ask forgiveness for her sin? She obviously couldn’t, she was completely incapable. That little baby that suffered so much in her short life, wasn’t able to take those steps to save her soul. So it’s done then? We are out of options? Ava’s not in heaven? The Bible is very clear that God gives salvation as a free gift and that He alone is sovereign. And God is good… didn’t we see that all through Ava’s story? And from the moment Ava died in our arms and Jason prayed that soul into heaven we have known in our hearts exactly where she was. She is in heaven! We believe this to our very core. The same God who gave us the grace to endure her illness and eventually her death, who gave us joy through it all and never left us alone will be faithful to the end. How could it be otherwise? God is good and always does good. God is just and always judges justly. Salvation is always, for any who are saved, entirely an act of grace, a ‘free gift’ (Rom 5:15-17), and even our faith – necessary to believe, is a ‘gift’ from God. So salvation is 100% a work of God applying Jesus death and resurrection to us by grace. We believe God applies this grace to those we are discussing who have never personally sinned, covering their original or imputed sin by Jesus atoning work on the cross. God does this entirely by grace as well, without their having faith. Dr. John MacArthur’s three in-depth sermons HERE (you can read the sermon manuscript by just clicking on the sermon title or listen to the sermons by clicking ‘high’ or ‘low’). And I want to add that John MacArthur has also written a book I love, “Safe in the Arms of God“, a must read for anyone who has lost a child. I read those points from Norm and I want to yell “AMEN” from the top of my lungs! And I read those articles as well and they resonate with my heart and my mind and what I take from them is that I completely trust in God’s love and faithfulness to care for these little ones, when they couldn’t do anything to possibly save themselves. He is just and good and I am to have no fear that Ava is anywhere but in heaven for eternity. And she is there not on her own merit, but only by the mercy and grace of her creator who could do for her what she could not do for herself. And so I’ll continue to visit her grave, even though I don’t get connection with my daughter that my heart craves. But I can say in faith, just like the faith that King David had when his baby son died, that babies go to heaven. I know that’s where Ava is and we will spend eternity together there with our Saviour. So now we are “6 and a half hearts” and I hope you’ll keep following us on our journey!